How to Core an Apple With Just a Knife - and No Waste! There are a lot of handy coring gadgets out there, some of which actually work. Even the ones that work have problems, however. First of all, because apples come in different sizes, these don’t always take out all the core from larger apples. Secondly, large or small, these tools waste edible flesh. If you’re trying to keep your kitchen gadget collection to a strategic minimum, they add to kitchen drawer clutter. But if you have basic knife skills, there’s an easy way to core apples quickly without wasting anything, using the kitchen knife you already have. 1. Assemble everything you need. You’ll need a cutting board, a sharp knife (we used a chopping knife, but a slicing knife also works well). 2. Chop the apple in half, then in half again. Remove the stem, and make your first cuts. You can turn the remaining half upside down on the cutting board to reduce oxygen exposure to the half you’re not working with yet. (If you’re fast enough, you don’t need to. 3. Slide your knife under the the edge of the stem. Starting at either the top or the bottom, place your knife just below the stem, and cut toward the centre of the core. Depending on the size of the apple, you’ll just be going a centimetre or two. 4. Change the angle of the cut to follow the outside of the core. If you miss it, no problem. Just turn the apple around and start again from the other side. 5. Pivot the sharp edge of the knife upwards to pop the core out of the apple. You’re done! On to the next quarter. The core is made of a denser tissue than the fleshy part of the apple. 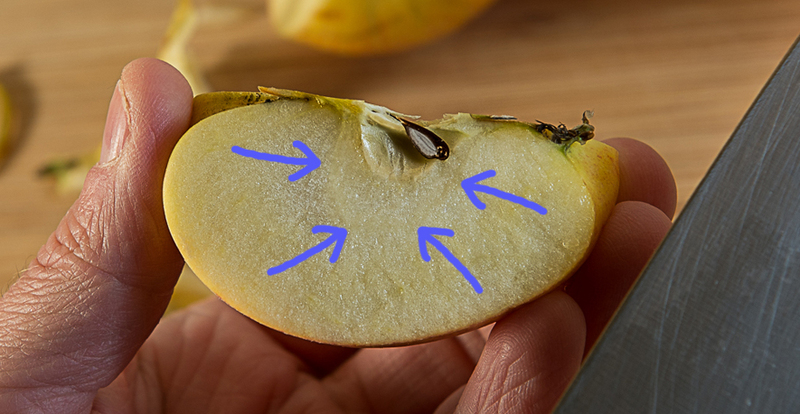 There’s a line called the “outer pericarp” that encases the ovary of the fruit. If you follow this line with your knife, the core pops out seamlessly. On some apples it’s hard to see, on others it’s almost invisible, but it’s always there. This method can take some practice to get, but once you’ve got it you can core an apple in seconds. The key is develop an eye for spotting the outer pericarp and the dexterity to follow it with your knife. 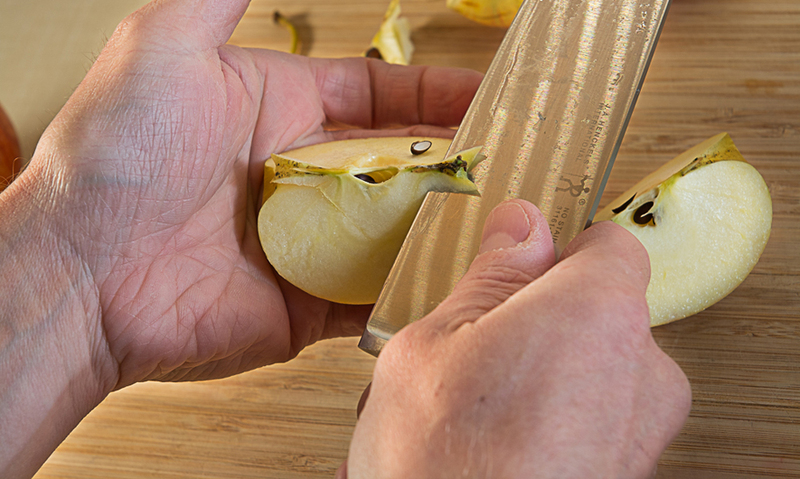 Apples give a unique and delightful flavour to desserts and breakfasts, but chopping them can be a pain. 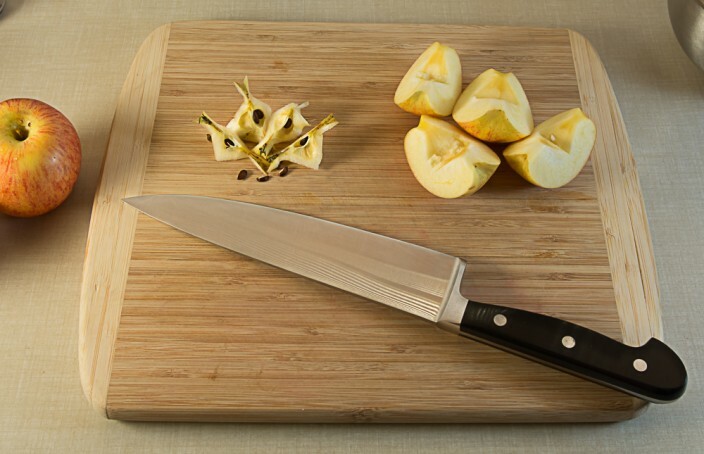 If you have a lot of ingredients to chop, you have to time it so the apples don’t turn brown. While not a disaster, the appearance of brown apple flesh can put some people off, the flavour changes and so does the texture. Pro tip: if you’re cutting a lot of apples, you can soak them in a bowl with water and the juice of one lemon water until you need them. This article says saltwater works better, but salty apples is not a flavour I like. The Ultimate Turkey Soup Recipe. I Am Not Kidding.